Many couples start life together with a kitten or cat before having a family. Sadly, the advent of a baby can result in the cat being rehomed. Many parents fear that their cat will either sit or sleep on the baby’s face causing suffocation. However, with careful thought and planning, it is possible to introduce the cat to both babies and young children and achieve a harmonious household. Remember, the cat should never be left alone with a young baby or in an area where he may gain access to the child, either through a cat flap or open window or door. This is a rule that should be remembered and applied to newborn babies right through to junior school age children. If you are choosing a pedigree cat to live in a family environment, it is worth bearing certain breed characteristics in mind. Hygiene factors: Precautions must be taken in pregnancy to avoid picking up the rare, one-celled toxoplasmosis parasite, so, preferably, your partner should take responsibility for the cat’s litter tray. If this is not possible, always use rubber gloves, and, after use, wash the gloves and your hands thoroughly. Make sure your cat is wormed regularly. Be very particular about your own hygiene and that of your family when handling pets, especially if you are about to eat or prepare food. 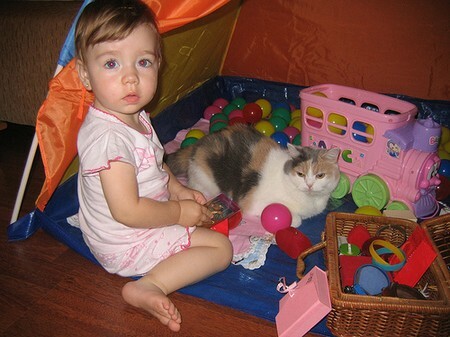 Training objective: To introduce your cat to your baby and achieve a harmonious (and hygienic) household. Allow your cat to smell the new baby’s belongings including both clean and used nappies. This lesson should be repeated on a regular basis over a short period of time. Essentially you are training your cat to realise that the new baby, and its associated paraphernalia and smells, do not represent a threat to your cat’s security. Accustom your cat to receiving attention only at your instigation. This must be done before the baby arrives. After the baby’s arrival, accustom your cat to receive attention after the baby has received attention. This trains the cat to perceive the baby as the prerequisite for receiving his own affection rather than perceiving the baby as competition. Feed the cats and baby separately and, preferably, at different times, from the point of view of hygiene and safety.